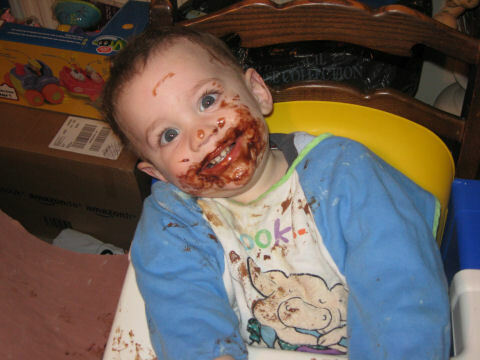 After being left to feed himself a Gu chocolate mousse. I said to him, “Hey Wil, smile for the camera!” and he immediately cocked his head to one side and beamed this grin. Smart kid. Other nephew highlight: Wil running around the house saying, “Gogglygogglygogglygogglygog,” in a serious and important voice, and then looking at me as if I’m a moron for not understanding. He’s got the crazies. It’s time to put him down.